Atago, one of the old-timers in World of Warships, offers a pure Japanese gameplay experience! It's a universal soldier that excels at medium to close-range clashes. 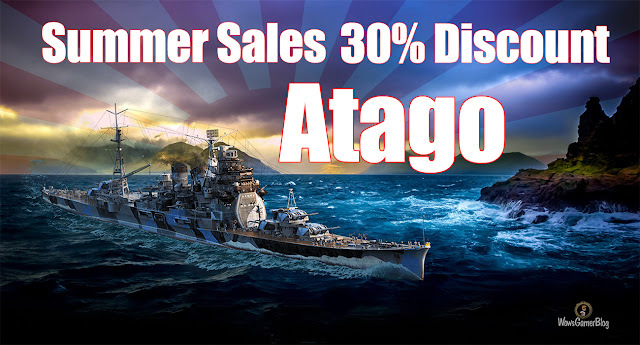 Numerous main guns allow you to hold your own in encounters with same-tier cruisers and destroyers while powerful torpedoes, with a 10 km range, turn Atago into a tough opponent even for battleships. Ten 203 mm guns with good alpha strike potential and nice ballistics. Two quad torpedo launchers per side with good aiming angles. Her torpedoes can deliver a maximum 17,233 HP of damage at 62 knots and a distance of 10 km. Excellent top speed of 35.5 knots and handling that is not typical of the majority of heavy cruisers. Access to the Repair Party consumable, which is unavailable for most Tier VIII cruisers. If you already have this ship in your Port, you will receive 10700 7490 Doubloons as compensation.